Best TV and home cinema systems for watching sport | What Hi-Fi? Feeling the World Cup blues? There's plenty of sport left in the year: the tense, drama-filled 2018 Formula 1 season is still underway, the Premier League is about to kick off again soon, and there's more tennis, golf, rugby, cricket and athletics peppered across your TV guide than we can even begin to list here. Whichever sport you plan your social life around, you're going to need a great TV or home cinema system to watch it through. 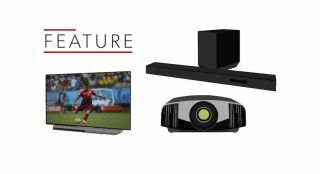 Here we have systems from under £1000 to nearly ten times that - all of which are centred around a 4K TV or projector. Some could suit those who only have room for a soundbar, while others will satisfy anyone who can accommodate an entire 5.1, 7.1 or 5.2.4 speaker set-up. Ultra-affordable Ultra HD is here! A much finer 4K TV than its budget price might suggest, this Philips has reset our expectations for what £500 can buy - which is, in this instance, a 50in screen, 4K, HDR and even Ambilight technology. Want to boost your TV’s sound without having speaker boxes cluttering your room? This Q Acoustics soundbase is a space-saving solution that you can place your TV on top of. Its zippy musicality, expressive detail and scale far exceed its compact physical constraints. It’s free, it’s both live and on-demand and it’s not lacking variety. Best of all, it's been the exclusive home to the BBC's 4K World Cup and Wimbledon coverage in the UK and is likely to be the home of future 4K broadcasts. Just remember to pay your TV license fee. This has its place among all the below systems. Already thinking past the World Cup and worrying Sky and BT’s Ultra HD sports coverage aren't frequent enough? Binged all of Netflix, Amazon and Sky’s 4K content? Get a kick out of towering Blu-ray box stacks? Then your first stop should be this brilliant budget 4K disc spinner, which delivers Ultra HD Blu-rays’ 4K HDR picture with punch, nuance and a natural-looking palette. What’s more, it will eventually support Dolby Vision alongside standard HDR10. Another formidable Philips, only this one is 55in, OLED and (with as much as £500 currently off its £2000 reviewed price) unarguably a steal. Despite the deluge of 2018 TVs starting to flood into our test rooms, this remains one of our favourite tellies for its prodigious value. Powerful, punchy and dynamic – just as an AV receiver should be – this Denon is proof that you can build a proper surround system on a reasonably modest budget. With 7.2 channels and Dolby Atmos and DTS:X support, a traditional 5.1 set-up can be bolstered with surround-rear speakers or a pair of height channels. Dali is behind our favourite AV speaker package for under a grand. It offers a seamless, beautifully integrated sound that’s a joy to listen to - and it doesn't look too shabby either. We truly believe that, if partnering with a £500 projector or £1500 TV, this Ultra HD Blu-ray player is the one to buy. It’s even subtler with detail and shades of colour than its Award-winner sibling (the UBP-X800), while retaining its exciting contrast and smooth motion. One of the first 2018 OLEDs out of the gate, this new, nearly entry-level LG TV boasts the Korean giant’s latest OLED panel, latest picture processor, Dolby Atmos support and a refined, voice control-enhanced webOS interface. It delivers individually small but collectively significant improvements over last year’s triumphant model. More space-poor than cash-poor? Then this sleek Dolby Atmos soundbar could be the solution. It feels more like a problem-solver than a compromise, opening up its soundfield when fed an Atmos track to deliver an impresive sense of immersion. And how could we forget its fine detail, surefooted agility, and deep bass? The perfect partner for one of the best TVs around? Why, one of the best 4K Blu-ray players of course. Our current high-end favourite for watching 4K Blu-rays, the Cambridge flies a flag for realism and detail. Faux 4K projectors are readily available for as little as a grand but native 4K models like this Sony are still pretty pricey. But, if your budget can stretch to a machine like the VW260ES you won't be disappointed. It produces an exceptional 4K picture for the money. Originally awarded five stars at £2300, this top-tier AV amp has fallen far enough down the price ladder to almost justify a sixth. The Denon’s thrilling dynamics and masterful control over every element will keep things edge-of-your-seat tense until the final whistle. Get ready to rearrange your furniture because this attractive 5.1 speaker package deserves pride of place in your home cinema. It’s wonderfully integrated and times with military precision without losing its penchant for fun. An impressive sense of body and scale, coupled with excellent detail and momentum, guarantees you a good time. Sky may not have broadcast the World Cup, but the media giant is currently the king when it comes to 4K sports. You’ll need the 2TB box and the relevant entertainment and/or sports subscription package, but trust us, Premier League football and Formula 1 have never looked better.